81 To take away a Hoarsness Tak a turnip cut a hole n the top of it and fill it up with brown sugar-candy and so roast it in the embers and eat it with butter. To take away the headach Take the best sallade oyle and the glass half full with tops of poppy floures which groweth in the corne set this in the sun a fortnight and so keep it all the yeare. Annoint the temple of youre head with it. 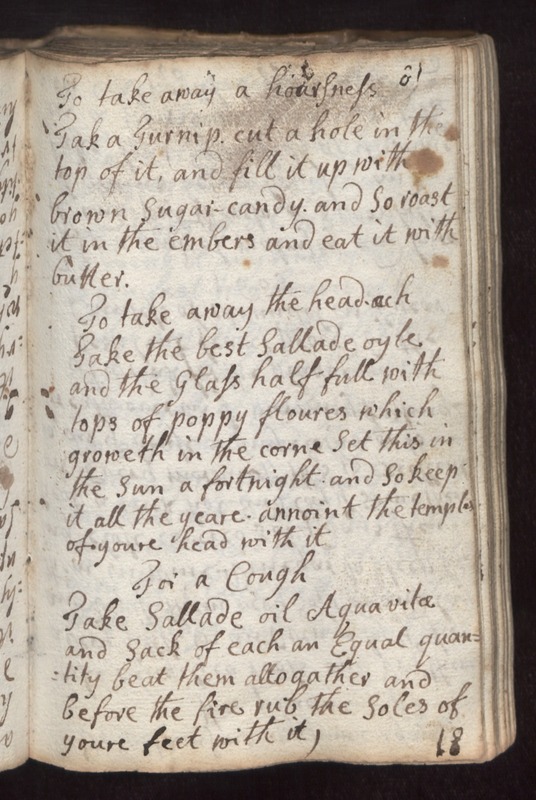 For a cough Take Sallade oil Aquavita and sack of each an equal quantity beat them altogather and before the fire rub the soles of youre feet with it.